Bake the cake in a 9x13 pan following the directions on the box or in your own recipe. Let the cake cool. Once it has cooled crumble the cake into fine little pieces in a large bowl. Next mix in about 1 cup of your cream cheese frosting until the cake is moist and sticking together. Next you can begin rolling lots of cake balls! 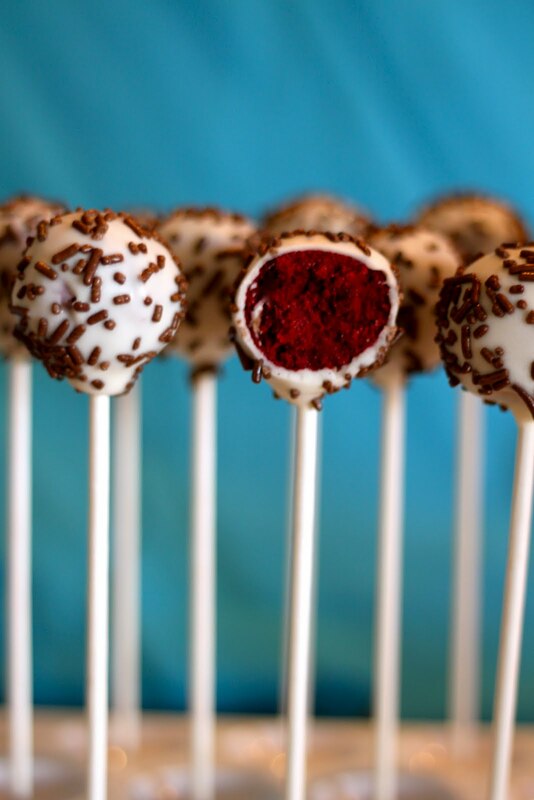 You should get about 50 cake pops, but it depends on the size you roll the balls into. Once I had all of my balls rolled I put them into airtight containers and in the refrigerator. I finished the second half of the process the next day and left mine in the refrigerator overnight. However, you only need to leave them in the refrigerator until they are chilled or in the freezer if you're in a hurry. This will help the lollipop sticks stand up straight in the cake balls. Now melt half of your almond bark or candy coating and 1 tablespoon of shortening in the microwave for 1 minute. Stir and then continue to melt for 15 second intervals until smooth. I added the shortening because otherwise the almond bark can be really thick and it makes it more of a challenge to cover the cake pops. The shortening helps to keep the white chocolate smooth and thin. I made my cake pops in batches because I didn't have enough Styrofoam to hold all of my cake pops while they cooled. Take some of your cake balls out of the refrigerator or freezer and dip the end of the lollipop sticks into the melted white chocolate and then halfway into the cake balls. Now place them into the freezer to set for about 5 minutes. This will help keep the cake balls on the stick when covering in the white chocolate. Once they have set dip the cake pops into the melted white chocolate and spoon it over top to cover all sides. Tap any excess melted chocolate off, decorate with the jimmy sprinkles while still wet, and stick into the styrofoam to set. Repeat this process until all of the cake pops are done. Melt the second half of the almond bark and shortening when needed. 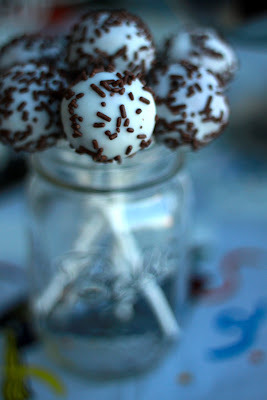 As the almond bark sets you can place the cake pops in an airtight container and store at room temperate or in the refrigerator if you like to eat them cold.